Today is part five of our continuing series on the Pantone 2014 Spring Colors. Today's color is Sand. I love this color. It's such a wonderful and easy accent to use with everything! Although Sand is a neutral, I've always felt colors in this family could stand all on their own. 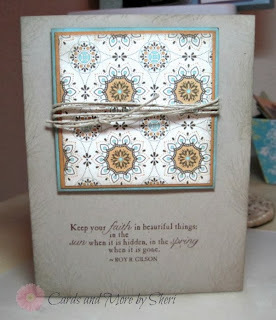 I love working with neutrals in my card making. Not surprisingly when I looked through my inventory to see what I had in this color family, it was no problem to find many items! I've selected three cards to show you today. This lovely card is blank on the inside for writing your own personal message. In this electronic age, it's a delight to get genuine snail mail! The color on the base is called Crumb Cake in Stampin' Up lingo! This is one of my favorite Christmas cards. I've again used Crumb Cake as the base. I love this stamp also. It's one of the oldest stamp sets in the Stampin' Up catalog and still going strong. Here's another pretty Christmas card using Crumb Cake as the base of the card. How do you feel about Sand and neutrals in general? Share you comments below!